For my fellow sci-fi aficionados, it’s a lot prettier than the critter Newt refers to in the Aliens franchise…. Black-crowned Night Herons (Nycticorax nycticorax) are the most widespread herons in the world, and can be found on all continents except Australia and Antarctica. As their name suggests, they’re most active during the dusk and night hours, resting during the day. Compared to other herons, these guys are small, stocky, short-necked, and short-legged — averaging 23-28″ in length and 25″ in height. The adults sport their descriptive black crown and back, accompanied by light blue-grey wings and tail, and whitish underparts. Their legs and feet are yellowish-green, changing to a pinkish-red during the breeding season. During the breeding times, they’ll also grow two or three long white plumes on their heads, that will stand up during greeting and courtship displays. Males and females look alike, but the females are a bit smaller in size. The Black-crowned juveniles display a dark grey-brown plumage, with white streaks and spots. Adult plumage is reached by 3-years-old — which is also breeding time. But my favorite part of these herons are their eyes: a brilliant bright red. And the youngsters? They have an equally gorgeous yellow stare. 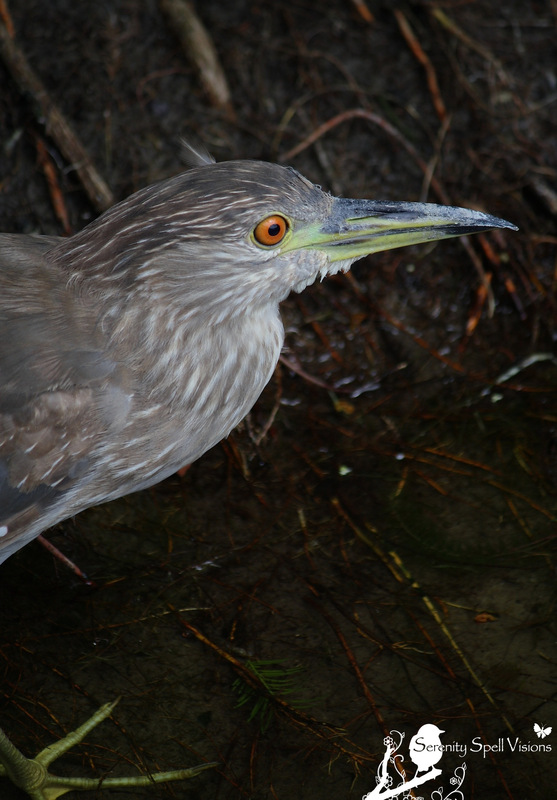 Adult Black-crowned Night Heron: Look into my eyessss…. 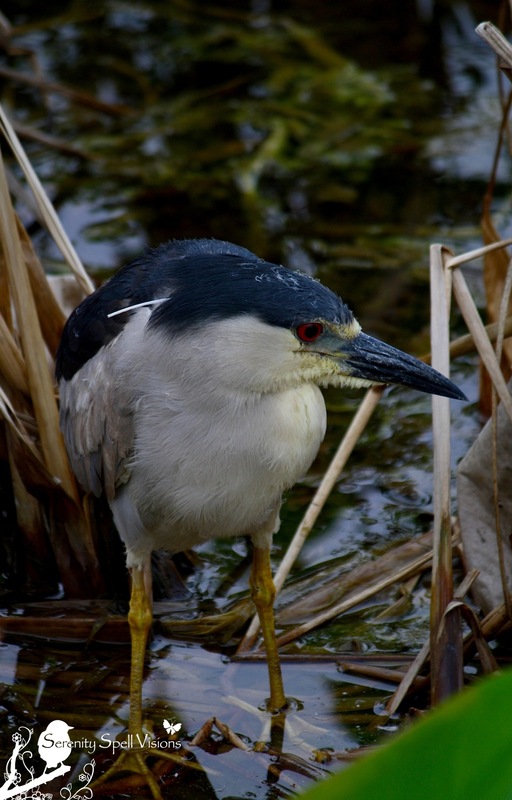 Black-crowned Night Herons prefer the fresh- and salt-water wetland habitats, including marine islands, swamps, rivers, canals, marshes, mangroves, and the more overgrown edges of lakes and ponds. They remain close to the water and near their favored trees, including pond apple trees, in our area — where they roost and breed. Their diet consists primarily of fish, but Black-crowned Night Herons will also partake in frogs, insects, crayfish, mussels, squid, reptiles, rodents, and aquatic plants. They’ll also loot the eggs and nestlings of waterbirds, such as terns, herons and ibises, and hunt small birds. Feeding takes place in the shallow waters, where they grasp their prey (instead of stabbing it). It’s a common sight to witness these herons standing stock-still at the water’s edge for long periods of time, waiting for their prey to come into range. They shake their prey until it’s been stunned or killed, at which point the heron swallows it head-first. Yummy! Black-crowned Night Herons are solitary hunters, and feed in the early morning and at dusk. 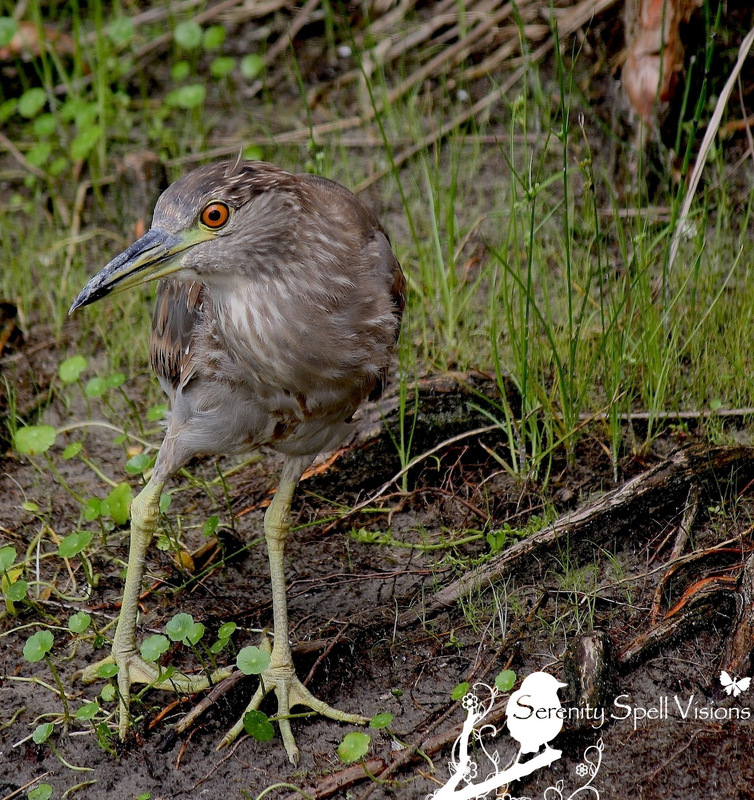 Theories of their nocturnal habits range from wishing to minimize competition for food with other waders, to avoiding harassment from other birds that are aware of the night herons’ habits of feeding on their eggs and young, and have, therefore, learned to attack night herons on sight. In the 1960s, Black-crowned Night Herons’ populations suffered a decline that was attributed to the use of DDT. They’re also hunted for food — particularly the juveniles. Additionally these herons are killed at fish farms, where they’re seen as a nuisance. Fortunately, alternate methods for managing many of the associated “issues” with these birds have been implemented, eradicating the need to slaughter these lovely herons. As with other wading birds, habitat loss and destruction (in addition to water pollution) of their wetland habitats in more recent history have had detrimental impacts in their decreased populations. SAVE THE WETLANDS and their most lovely and amazing inhabitants! In many parts of the world, this heron is named for its calls. In the Falkland Islands, it’s referred to as quark; kwak in Dutch and Frisian; and similarly in Czech, Ukrainian, Russian, Vietnamese, Indonesian, and other languages. Black-crowned Night Herons can live up to 30 years in captivity, and 20 years in the wild. While hunting, these herons use a technique called “bill vibrating.” They open and close their bill rapidly in the water, which creates a disturbance that lures prey. Your post reminds me of birding with my mother in farming country here in the Pacific Northwest and finding trees full of these birds in people’s yards! That was many MANY years ago…. <:-D Thank you for the lovely memory! This story brought back memories for me as well. A family of these lived in a palm tree right next door to where I lived in Redondo Beach, CA. I learned why they are in fact called NIGHT Herons. Beautiful birds and they definitely live up to their name. What an incredibly kind and thoughtful thing to say… I can’t thank you enough for such wonderful words!! It’s my greatest desire to do just that — show the beauty of this endangered place, and my love of the Natural Kingdom — so I am over-the-moon thrilled if it comes across, even an iota. Fantastic photos of the BC NH! Have you ever heard groups of them flying in the evening? Sounds like a bunch of yapping puppies! Thanks so very much!! I really love these guys — so shy but really unique. But NO! I’ve never seen, or heard them in groups! They’re always solitary when I see them in our wetlands and in the ‘glades. The eyes have it in all the photos. Nicely done. Thanks so much! They’re such interesting and unique herons — always a bit timid, so I’m happy when I get decent shots of them. DITTO! I have so many favorites, but the Black-Crowned and Green Herons are at the top of my list, too. Perhaps because they’re a bit shy? Well, the Greens b/c they’re just so brilliant. 🙂 But you know, I don’t have *any* shots of a Yellow-Crowned Heron! You will eventually run across a Yellow-Crowned Dritter – and when you do, it will make your day. Your shots are simply awesome, and I look forward to each and every one of your postings. My day was in film – I envy your masterful digital work! So where did you go for those Blackies? You’re so very kind, thank you!! I hope to get out soon again on a decent hike… Perhaps one day we’ll meet up!! I only did a bit in film, and this was years and years ago. My family still has the old Canon safely tucked away in their attic. 🙂 I know many who are returning to film — as difficult, comparatively speaking, as it is! For these guys, it was a bit of a smattering. Some at Green Cay, some at Arthur R. Marshall. I’m always excited when I get a decent shot of them, since they usually stick so close to the tree- and waterlines. I got my best Yellow-Crowned Heron shots at … wait for it … A1A, smack dab in the middle of the South Palm Beach condo zoo! On a couple occasions, I ran across one tucked into the mangroves on the Intracoastal. FROM GATOR APPEAL TO BIRD APPEAL!!!! I THINK THE BIRDS MUST TRUST YOU TO POSE FOR YOU WITH SUCH OPEN HEARTS!!! GREAT WORK!!! THANK YOU!! BEST SHOTS ARE THE CANDID ONES – THAT IS FOR SURE!! Fabulous shots! I’d love to see them up close and in person! What a great series of photos! My favorite “fun fact” was that they do “bill vibrating” to lure prey. What clever little things they are! Thanks so much!! Isn’t that interesting? That tidbit was new to me as well — although I knew about their lack of stabbing the prey (as many other herons do), and swallowing it whole. What great birds and great photos! Thanks so much! I adore these guys, so unique and (seemingly?) shy…. Wonderful post. A lot of information and really nice images of one of my favorite species! I can’t believe I haven’t found your blog before now. Will be following from now on. A great message, thank you! Fantastic captures, and I really do appreciate all of the hard work you do putting together such a beautiful, well researched informative post. This little one is just the cat’s meow! Aw, you’re so kind! I love learning new things about the guys I see all the time… For me, the bill vibrating was fascinating. the mangroves just beyond my house have night herons; we received our first rain after a long dry season this week, and like magic, the night herons are back frolicking in the tree tops! Ah, how wonderful!! We just had a bit of rain too, after a dry spell. I’m sure the critters are very happy. I most often see them solitary, not in groups — but I hear they can make quite a cacophony when they get together! they were so loud last night that i almost got out of bed to record them! they must have sensed my thoughts, as they quickly got quiet! it’s so great to watch them during nesting season! That’s hysterical. We have limpkins (I have a post coming up on these guys) that do the same thing, with their screaming wail. A great series of close-up photos of these beautiful birds. Thanks so much! I’m always thrilled when I can get close enough to these usually shy guys…. 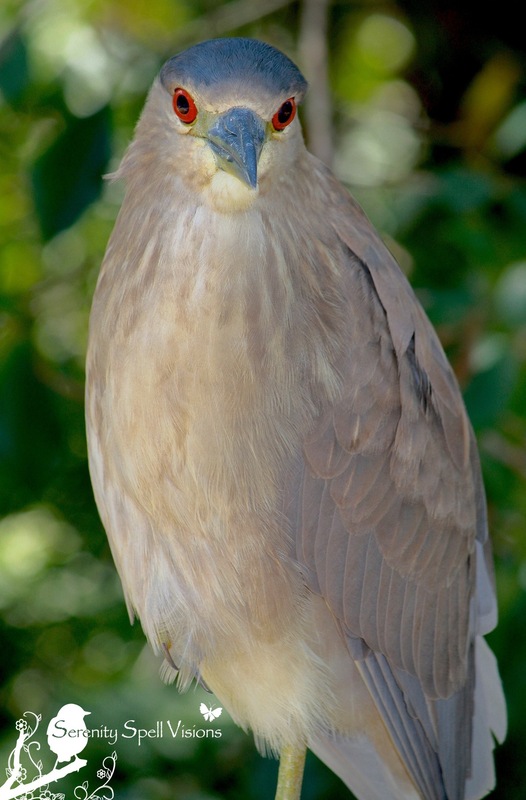 Hi there – great set of pictures – we do have some night herons in Australia – but not this one! Will endeavour to get some pictures – but its too hot today!! Cheers and thanks for linking to WBW – Stewart M – Melbourne. Thanks so much! You have a wonderful resource… So very glad to have found it (finally!). We have another type of night heron, that I’ve yet to see in the wild — but I can’t wait to see Australia’s! Thanks so much!! I always learn a bit too, about critters I see all the time ’round here… In this case, the bill vibrating was new to me! All life deserves full appreciation and some modicum of knowledge, yes? That bill vibrating sounds as though it would function like certain fishing baits – especially the rattletraps. We have so many black-crowned around here – I love the nights when I can keep the windows open and hear them. They do squawk when someone scares them off their lines! I can’t believe you’ve never photographed – or seen – a yellow-crowned heron! I see them all the time – so often that I actually learned how to distinguish the juveniles from the adults long before I could do it with other species. I work in one marina where they fish from the rocks along the channel. They’re fun! It’s so odd, because many are saying how they see these guys (the black-crowns) in groups, but down here they’re always solitary, and very timid, sticking close to the treelines and waters’ edge. So interesting! I’m at the edge of Galveston Bay and Clear Lake, half-way between Houston and Galveston. The yellow-crowned are so common here along the ditches, I see them from the car while I’m commuting to work! With high tides, they can be even more common. Interesting. That’s so funny… Perhaps I’ve seen them, and simply didn’t know WHAT I was looking at! That’s certainly happened before. I’m not an expert by any means, hahah! It’s interesting how species populate certain areas — I have an endangered wood stork outside my little home, hanging out with the ducks. 🙂 Always shy, of course. 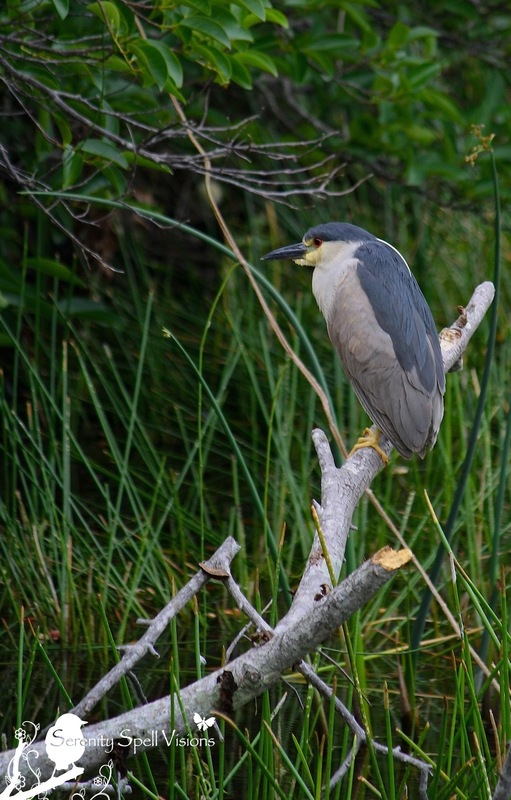 Beautiful shots of the Black-crowned Night-Herons Christina! I believe that all the herons are amazing species and enjoy watching them hunt. I appreciate your commitment to nature and the planet and I long to see the Florida everglades for its rich biodiversity. I am part of a movement to increase much needed revenue for our National Wildlife Refuges by creating an alternative to the “Duck Stamp” we are calling a “Wildlife Conservation Stamp.” Hopefully you will hear more about it after the new year begins as we contact our legislators with a proposal. In the meantime, there is a petition we are urging people to sign. You and your readers can find out more about the proposal at our website under construction, WildlifeConservationStamp.org. Thanks so very much! I truly appreciate your kind words, and am thrilled that my love and respect for this amazing ecosystem is conveyed. What a wonderful movement / cause! I will definitely sign this, and if you’d like me to write a bit on it — or if you’d like to write a brief guest post — please let me know! love the blue plumage in the second photo… what a lovely bird. Thanks so much! They really are fascinating herons… I love them particularly because they’re tough to capture! They must have powerful jaw muscles to grasp their squirming prey and shake them around like that. They are quite beautiful. You’re absolutely right… And the speed with which they attack is stunning — surgical, lightning strikes. They’re really amazing creatures when you break it down. Real beauties, but their call must be something else from your description. We don’t have these night herons in the Pacific NW. I think we only have egrets and great blue herons, but I could be wrong. They really are very striking…. You may not have them; many herons and egrets only make it to the southern states and tropical areas. But to see them is a treat. 🙂 And yes…to hear them. Another treat altogether, hahaha!!! I don’t think the great blue herons want any competition here, lol. They like to have all the fish for themselves. Hee, they’re big enough to bully their ways to the fish — at least in the wading world! The herons here have enough bullies, if owls and crows count. I’m not complaining though since I’m a fan of the PNW herons.